Share Your Motherly Wisdom & Enter to Win Free Shoes for a Year! You all know I love shoes right? One peek in my closet will confirm that statement. Shoes help pull an outfit together, give it personality and change your life. I mean Cinderella is proof that a pair of shoes can change your life! How would you like FREE shoes for ONE YEAR from one of my favorite shoe stores – Rack Room Shoes? Sounds amazing right?! Read on…. You know how everyone says your kids grow up in the blink of an eye? They do. They really, really do. I’ve watched my funny, blonde hair, sometimes slightly crazy toddler girl transform into a beautiful inside and out, caring, young lady who is nearing her 18th birthday. My quiet, wise beyond his years, smile can light up a room, middle son is now a man who helps calm me in stressful situations and makes sure I get at least 4 workouts in a week. My didn’t think sleeping was important, liked to throw fits walking into preschool, baby of the family has turned into a young man who loves life, wants to know a little bit about everything and is so kind to kids younger than himself. When my kids were younger, I was always thinking about their next stage and couldn’t wait to get to it. I can’t wait until they can feed themselves. I can’t wait until they’re potty trained. I can’t wait until they don’t rely on me so much for everything. I can’t wait until they’re older. The teenage years are about just that – building a relationship that will last your lifetime. I tell my kids all the time that the relationships they build will their siblings now, the words they choose to use when they speak to each other now and the way they treat each other now, will have a great impact on their relationship in the future. Your siblings can be some of your best friends when you’re an adult and that’s an amazing thing to look forward to. It’s the same with my husband and I with our kids. The foundation we’re building with our kids today, is one that will carry over to tomorrow and for years to come. If I had to narrow my motherly wisdom down to one sentence it would be: Strive to have a home that focuses on building strong relationships where you compliment more than you put down, laugh more than you frown and let things go more than you hold on. Now it’s YOUR turn! I know you all have motherly wisdom to share and Rack Room Shoes (and me!) would love to hear it. Motherhood doesn’t come with a handbook––but somehow moms just seem to know what to do! Day in and day out is full of carpooling, meal-planning, lunch-packing, advice-doling, and skinned knee-kissing. It’s no wonder mother knows best––she’s seen it all! This Mother’s Day, Rack Room Shoes is celebrating all the wisdom our moms have taught us (or we’ve learned from our own experiences) through the years and rewarding it with free shoes for a year. Tell us the most important thing you’ve learned with the hashtag #InMomsShoesGiveaway, and you could win a year’s worth of new shoes––because you’ve earned it. Ten grand prize winners will be selected at random. Share #InMomsShoesGiveaway wisdom, and you could win. Happy Mother’s Day! Prizing – Free Shoes for a Year! Rack Room Shoes to select a winner a day for 10 days. How to Enter – Comment on Facebook! 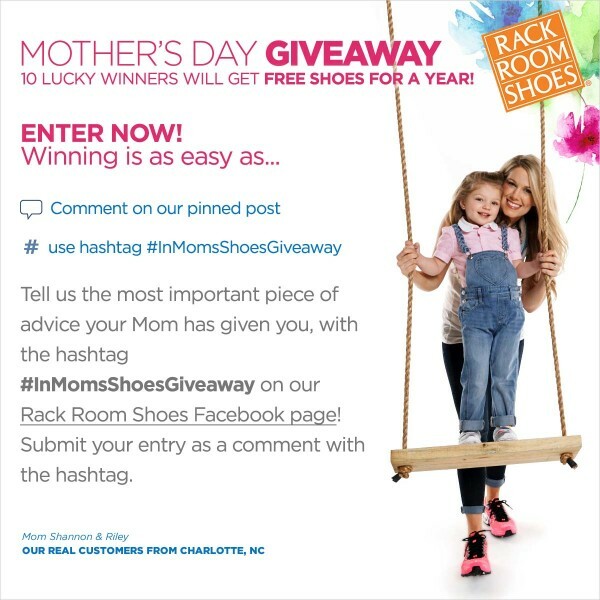 Entrants just have to submit their “motherly wisdom” with #InMomsShoesGiveaway via comment on the standing Mother’s Day image on the Rack Room Shoes Facebook page from May 1 – May 10. The giveaway will go live May 1st at 9:50 a.m. EST. This Friday, May 1st, at 10:00 a.m EST, Rack Room Shoes is participating in a Mother’s Day Twitter party talking about just why mother knows best. Join them for the fun #InMomsShoes Twitter Party and share your most esteemed advice as they talk motherly mantras, fashion tips and your “real mom style.” Plus, co-host @SavvySassyMoms and guest @myrackroomshoes will be joining to discuss the latest trends and, of course, your favorite spring shoe styles – with giveaways of free shoes throughout the entire party! Party prizes include (5) $75 Rack Room Shoes gift cards to use on their extensive selection of name brand shoes for the family. Are you excited?! I wish you the best of luck on the giveaway!